Flow: Copy a Team Flow | Where have the days gone? T he Microsoft Flow team announced yesterday that the “Save As” feature is now available for Team Flows. It was previously only available for your own Flows. The use case might be a Flow you shared with your co-workers so they could run it on demand, and then you find that an additional, similar yet different, Flow would be useful, so you’d like to copy it and then tweak the copy a bit. This was actually a question that was raised during my Microsoft Flow presentation at SharePoint Saturday Baltimore in May, but at that time, only “My Flows” could be copied. So this is cool. Note that the message that appears when you click “Save As” says that what this does is copy the Flow as a “My Flow”, without the co-authors (i.e. the “Team” with whom you had shared the Flow) or the connections the Flow used. I found in testing this, that the Team Flow I copied did still refer to the SharePoint site and list to which it had been connected for its trigger. This Flow was one that was created to run on a selected item in a SharePoint list, and after I activated the copied Flow, it did appear on the Flows menu when an item was selected. But of course, other users can’t see the copied Flow until I again share it with them and make it a Team Flow. I also checked the list of “Embedded Connections”, which you can see when you click on the “Invite another owner” icon (looks like little people) beside the Flow’s name, or from the Flow’s information page (click on the Flow to go to the information page, then click on “See All” in the Owners section). It appeared that all of my existing embedded connections (there were four in this Flow) were still there. 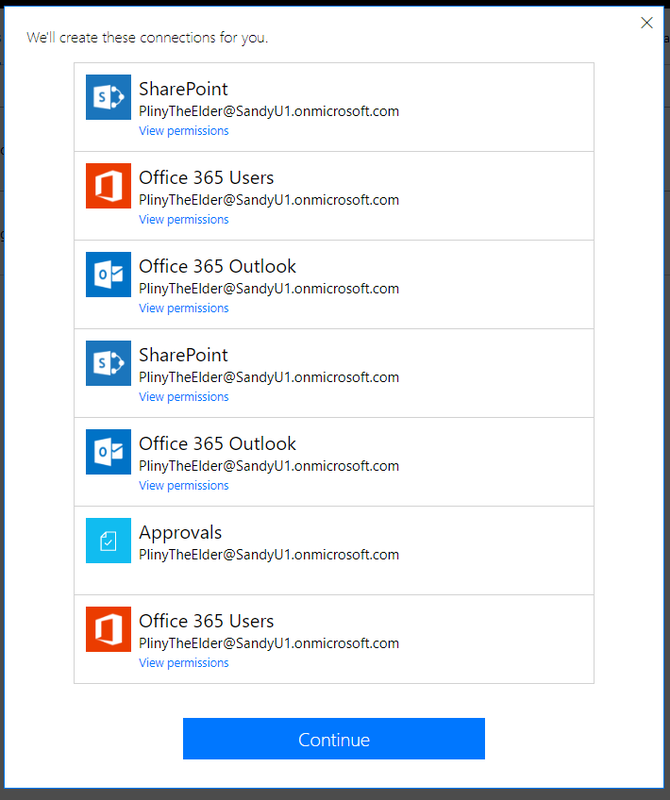 I also tested copying a Team Flow that used a Twitter connection as well as SharePoint, and both connections seemed to copy over. However, I was the one who created these Flows to begin with. To test further, I tried copying one of the Team Flows when logged in as one of the other Flow owners (Pliny the Elder). In that scenario, Flow said (before the “Create Copy” message shown above) that it was going to make the required connections for him, because they didn’t exist under Pliny’s account. (I’m unsure why it created multiple instances of the connections, though. After the copy was made, there was only one of each connection in the copy, as I would expect.). Flow was able to automatically make these connections because they’re all available to Pliny under my O365 tenant. But when he tried to make a copy of the Team Flow which used my Twitter account, he was prompted to sign in with his own Twitter account to create the connection in the copied Flow (also what I would expect). NOTE: The behavior described in this post was current as of the end of June 2017. It may be different at a later date.